An air compressor has a variety of applications: such as tyre inflation, paint-spraying, stapling and nailing. 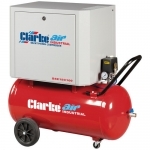 We stock a huge range of air compressors, from portable through to industrial models. Our petrol and diesel models are ideal for site use or mobile applications away from mains electricity. We also stock an ultra-quiet air compressor range for situations where noise is unacceptable, ideal for offices, shops, studios, laboratories and surgeries. We have a wide range of air compressors suitable for DIY enthusiast through to professional tradesmen at competitive prices.